It’s an ‘egg’stravaganza of ‘egg’strodinary, ‘egg’tastastic fun!! 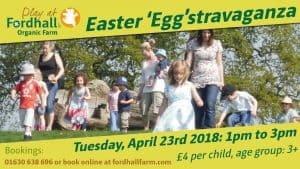 Decorate your own egg and have fun rolling it down the hill, new for 2019 we will also make some Easter decorations out of wood as well as build your own wooden bunny to take home! Suitable for ages 3-14. 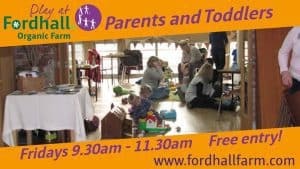 We’d love it if adults came to join in the fun too! Please click the ticket link to book your places now or call us on 01630 638696 – PREBOOKING IS ESSENTIAL!! 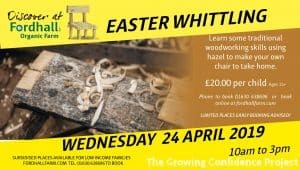 Learn some traditional woodworking skills using hazel to make your own chair to take home. There are also opportunities throughout the day to make your own keyring and wooden rabbit. This session is part of our Growing Confidence and for ages 11 – 25 only. Please bring own lunch and refreshments. £20.00 per place including all materials and your hand made items to take home, please click ticket link to book. Due to the nature of this special event places are VERY LIMITED please book asap to avoid disappointment! 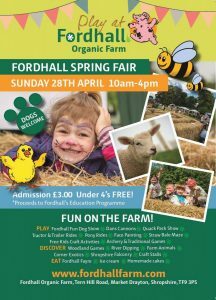 Come and visit the lambs, enjoy the falconry display and perhaps enter your own four legged friend into the Fordhall Dog Show! Meet exotic animals, donkey rides and enjoy a tractor and trailer ride, take in the scenery, visit the stalls and enjoy a fun day at the farm! 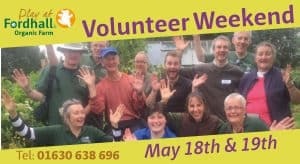 Our famous volunteer working weekends focus on outdoor work, where you get to help us with conservation, wildlife and access focused projects. These weekends are great fun and everyone always leaves with a real sense of fulfillment from what they have helped us to achieve. 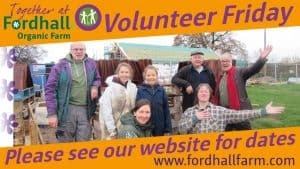 We will match the jobs to you, assign you to a group and give you all the instruction you need from one of our fantastic Fordhall leaders. Then you set off and get your hands mucky! Past jobs have included building a boardwalk, putting in steps, planting wild flowers, building an otter holt, building bridges, planting fruit trees, scrub clearance and hedge laying. You will never be bored! On these weekends you can stay in our yurts, camp or we can provide you with local B&B information. These weekends are FREE but we do ask for a donation towards all the yummy organic food we cook you over the weekend…….no one ever leaves hungry!